Those voters looking forward to a second term for Barack Obama, were shocked by the President’s sub-par first debate performance. A month before the election, it now appears that an Obama victory is no longer a certainty, pending a final judgment, of course, on the findings of post-debate polling. If Obama continues his laid-back style in upcoming debates, Romney may persuade enough voters, especially in crucial swing states, that his vision of Republican conservatism, is superior to the current policies of the President. In the first debate, the President displayed a surprising indifference to attacks from Romney. One debate performance does not a defeat make, but it does remind Obama supporters that no politician can avoid the threat of “a bad moon rising”. Carter’s indictment of the current Supreme Court is a reminder that the election of Romney would assure the continuation of a right-wing court well into the next quarter century. Elections do have long-term consequences. If Obama continues his lacidasical debate style, the neocons shaping Romney’s views on Israel and Palestine, will rejoice all the way through the November 6 General Election. There is, without a doubt, a “bad moon rising” over Obama’s campaign. John Fogarty wrote Bad Moon Rising in 1969. He and his band, Credence Clearwater Revival, made it a staple of their concerts during those days when darkness constantly loomed over a generational longing for better days. Bad Moon Rising was first a hit single. It became the feature cut on the Credence Clearwater Revival‘s album, Green River. Bad Moon Rising was eventually recorded by over 20 bands and singers. It was featured in the 1983 film, The Big Chill. Fogarty said he wrote the song after watching the film, The Devil and Daniel Webster, which included the depiction of a destructive hurricane. For those whose hearing is not attuned to the musical language of that era, the song’s opening lyrics may be found below the video. I thought of that song, one of my favorites from the 1960s and 1970s, at the beginning of this campaign. I have been holding it for the right time during this election, should the need arise. This week seems to be the right time. For Obama backers, the “bad moon on the rise” reminds them that debates can be deadly to candidates who perform poorly. Moderator Jim Lehrer failed in his job as moderator. Igor Volsky is the deputy editor of ThinkProgress.org. In a posting on that site, Volsky identifies 27 “myths” that Romney claimed were facts. Did the viewers even notice how much Romney’s style was used to obscure his vagueness? In his moderator’s role, early on in the debate, Lehrer lost control, a failure which Romney continually exploited. President Obama, standing on the stage with Romney, was unwilling, or unable, to display the outrage that such “myths” would normally evoke from someone who knew that the facts Romney tossed about were either false or deliberate distortions. Were viewers bored with all the numbers talk, or could they be guilty of just not paying attention? It is, after all, a time-honored American sports adage that voters “do not pay attention to the election until after the World Series has ended”. The President’s surprising, almost casual style left the impression that he seemed indifferent to what the New York Times reported as 67.2 million viewers who tuned into the debate. If the “time-honored American sports adage” about elections and the World Series, is still operative, the failure of voters to pay attention will prevail well into November. The Big Money owners who run major league baseball have pushed the World Series well beyond its traditional date of early October. They did not do this to affect elections. They were motivated instead by another adage of America’s Big Money, “greed is good”, made popular by Michael Douglas (as Gordon Gekko) in Oliver Stone’s 1987 film, Wall Street. President Obama missed a huge opportunity when he failed to link Romney to Gordon Gekko’s appeal to greed. It would also have been a nice segue into a discussion of Romney’s rejected 47%, those voters Romney described in a secretly taped fund-raising event in Florida, calling the 47%, “takers, not givers”. Obama also missed a chance to point out that the real “takers” of our society are the one per centers at the top of the pay scale, who want their tax rate kept low, a clear celebration of Gekko’s philosophy of greed. He was referring to the recent U.S. Supreme Court decision that allows “unlimited contributions to third-party groups that don’t have to disclose their donors”. The dynamic is fed, Carter said, by an income tax code that exacerbates the gap between the wealthiest Americans and the rest of the electorate, allowing the rich even greater influence over public discourse and electioneering. He added that he hopes the “Supreme Court will reverse that stupid ruling”. Had Obama quoted Carter and Gordon Gekko during the debate, the media might have given him credit for two “zingers”, memorable moments that would be remembered long after the election is over. There is a “bad moon rising”, when the President who burst onto the political scene through his inspiring oratory, missed too many opportunities to “zing” a former Bain corporate executive who still keeps a portion of his fortune in off-shore investments. 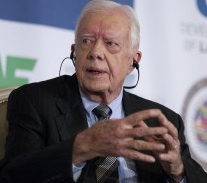 The picture of President Carter, above, is from Huffington Post. This entry was posted in Media, Middle East, Middle East Politics, Netanyahu, Obama, Politics and Elections. Bookmark the permalink. I have always loved this song. Brought back memories of another era! I have been disappointed in Obama since 2008.Romney can’t even relate to most of us. What you say, Jim, is very true. However, it does pose a sticky situation. If criticism of Obama’s performance on this first debate continues, might such criticism leave in the mnds of voters, the idea that Obama does not have it all togethere? It is OK to cretique in house, but once such cretique goes “out” it becomes damgerous. As I said, sticky. If President Obama was mentally and emotionally occupied by a secret operation the Special Forces were undergoing in Libya, then his performance could be understandable. Anything short of that is incomprehensible. I do sincerely hope that President Obama will come back swinging, next debate, looking up, and armed with facts and figures. He should not shy away from reminding “independents”, and others alike, what a “cluster-bomb” of disasters his team was handed in 2008. The worst ever handed to a new President in US history. Dwell on it a bit more and, yes, remind people of some of the pertinent details. “Their Plan led us to the cliff, and Romney’s is to give it a shove”. Perhaps, he could use a similar refrain as he brings up each of the “disasters”. I have no doubt that Obama will do well next debate. I suppose anyone who enters politics at this level has a relatively resilient ego … but I do wonder what it feels like – and how you recover – when the entire nation agrees that you blew it. Pray his recovery is swift and robust. I beg to differ with your alarm about Obama’s performance in the first debate and what that may mean for the election outcome. The Romney presentation was so tense, so full of distortions , ridiculous accusations, and lies, that Obama would have been lowering himself to Romney’s level if he had answered these attacks. Romney was abrasive and rude to both Obama and to Jim Lehrer. That got under Lehrer’s skin, but not Obama’s. The consensus by pundits and media that “Romney won” is what is driving the perception that Obama is in trouble. Please don’t pile on. There are more debates to come. Romney is sure to make more gaffes of the 47% type.Polling in swing states will show Obama still ahead. In foreign policy Romney is ignorant and fatuous. My concern with the foreign policy session, however, is that Obama will toady needlessly to Israel and AIPAC. If Romney starts quoting Bibi approvingly, Obama has the perfect opportunity to say that his responsibility is to provide for the common defense and promote the general welfare of the US, and he knows more about how to do that than do Bibi and the neocons. Excessively pleasing Israel is not in our interest.Bibi’s actions and words are creating danger for Israel more than for us. Am I just whistling Dixie? I don’t think so. Please: Do another post which showsthat your your concern about the outcome of the debates is now reduced..
scratching my head over the president’s performance and thought that, if not ‘a bad moon rising,’ something was definitely wrong. Like he threw the fight. …so many topics to choose from in which to rub Mitt’s nose – ‘Gordon Gekko’ particularly – but Obama gave him a pass. If the debate was a boxing match, Obama had his gloves near his face all night, and hardly threw a punch. President Carter, a decent man…from the old school…very unlike those pumping billions into Romney’s campaign hit the nail on the head. Secretive One-per-centers sneer at such decorum (and insight); and many amongst them have no respect for ethics or for ‘playing by the rules.’ They make them up as they go.